How Are Short Waves Propagated? 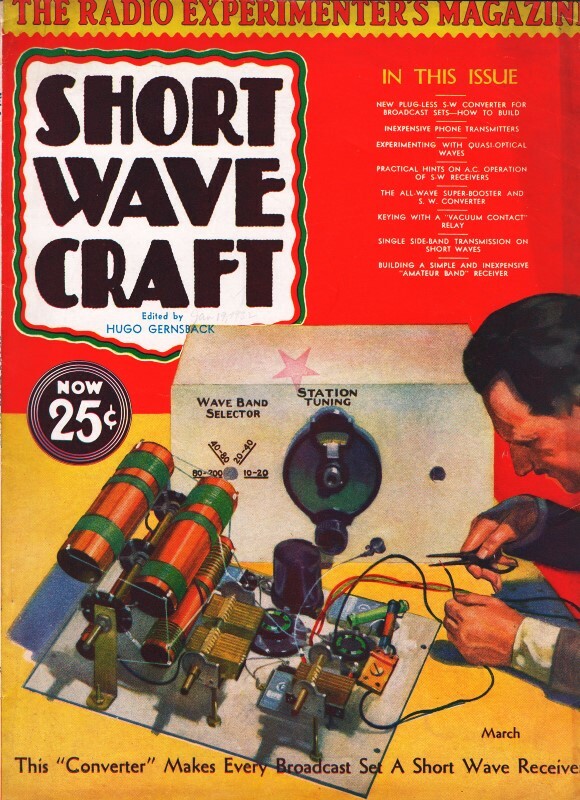 This is the second of a two-part article titled "How Are Short Waves Propagated?" The first part appeared in the December 1931/January 1932 edition of Short Wave Craft. Uniformly dry air over transmitter and receiver seems to be the best condition for good "DX" (distance) radiation (by day there is strong inter­ference by increased absorption). Conditions change with the increase in moisture in high strata above the transmitter or receiver (formation of cirrus clouds). The "DX" possibilities are then strongly limited; but close communication (say, over distances found in Europe) is still possible at times. A high degree of moisture near the ground has apparently little influence, if the air above is dry and uniform. It is a matter as yet undecided, whether the relative moisture of the air or the presence of a smooth surface (lack of uniformity) plays the decisive part. There is much to be said for the latter assumption. Fig. 5 - Assumed diffusion of energy by strata of high relative moisture; normal course of radiation in dotted lines. For the sake of simplicity, a straight course of radiation and reflection was drawn, instead of indicating refraction. Appearances are such as to justify a hypothetical explanation as in Fig. 5. One might assume that in the passage through unlike strata, a diffusion of the radiation occurs. The sharp angle of the maximum radiation is broadened, the en­ergy accordingly diffused. One hears signals more weakly, but possibly in a much wider zone. For "DX" distances the energy is weakened too much, if the diffusion occurs directly over the trans­mitter, but for slight distances (Europe) it is still sufficient. One hears from European distances more weakly than at the most favorable times; but one hears at a time when one normally can" no longer expect close reception, because of the movement of the zone of audibility, which has already occurred. It is another matter when the diffusion occurs only over the receiver, while the radiation is not limited over the transmitter. 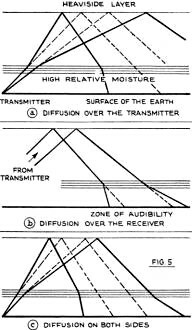 Then one can hear "DX" stations, though to be sure not so well as at the most favorable times; but he can determine that he hears at the same time from more countries, from far wider regions, than in the case of "good DX weather." To be sure, there is then little prospect of successful activity on the part of one's own transmitter. 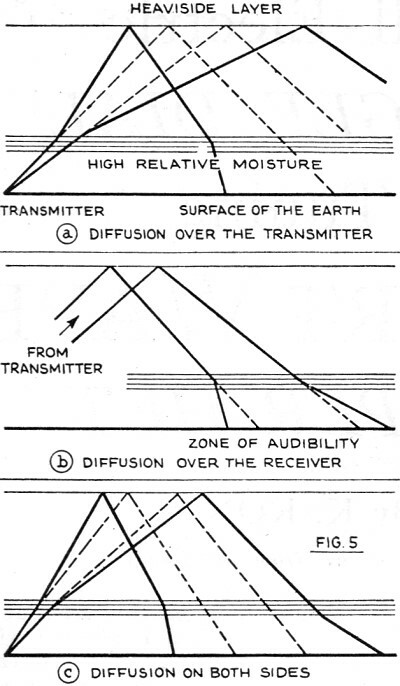 Naturally the conditions are worst when diffusion occurs over both transmitter and receiver. The weather conditions mentioned there­fore bring a widening of the zone and a reduction of receiving intensity. The frequently-mentioned "air pressure" is of significance only so far as it plays a part in the movement of air and, thereby, in the moisture conditions in higher strata. The same statement holds for the temperature. Meteorological conditions in the intermediate stretches are entirely of no moment. The radiation runs along in strata of the atmosphere, which are far higher than those in which meteorological processes occur (30 to 60 miles, compared with at most six miles, below the stratosphere, in which conditions are" constant). The energy diffusion by strata of high relative moisture at a rather great height is, we must again insist, a theory, which is justified on the basis of the phenomena observed. An explanation of how the energy diffusion occurs cannot yet be given. Therefore I can as yet merely say: "It is as though . . ."
Therefore the broadcaster strives in vain, if he tries to improve the reception of the ground wave, in this or a somewhat greater radius, as against the reception of the space radiation of strong distant stations, by competition in the output of energy. The improvement also strengthens the distant stations, and the zone of "space radiation" is widened. Since the space radiation alone is in question in distant reception, even on long waves, the formation of zones and their shifting, together with the atmospheric conditions, can be perfectly observed in the case of long waves.